Baseball, the National Pastime. For 141 years, it is a game whose numbers and names need no introduction. Mantle. DiMaggio. .406, 755. Ren. Stimpy. 2K, holder of the exclusive third-party publishing rights for MLB video game products, will take a swing at the market with Nicktoons MLB for the 360, Wii and DS. The 360's version will be the first kinect-enabled baseball game, according to a release. 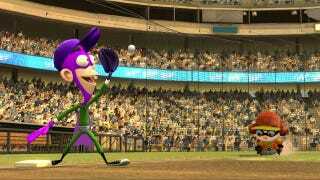 Nickelodeon will send Ren and Stimpy to bat, along with SpongeBob, ZIM, Dudley Puppy, Fanboy and Chum Chum (pictured). Of Major Leaguers, hitters like noted safe driver Miguel Cabrera will appear. No release date was specified. 2K has had a hit-or-miss relationship with its secondary MLB products since acquiring the license in 2005; The Bigs was considered a success; The Bigs 2 was alright but failed to impress at the register. Front Office Manager was killed after one year. Lighter fare like MLB Stickball and Baseball Blast were largely panned. On the plus side, these will probably be the most accurate player models in a 2K MLB game to date.